The new Xcode integration allows you to do pretty much anything in Github directly from Xcode, like browsing repos and pushing commits. Creating a remote Github repo from Xcode. Let's cover each of these integrations in brief with Xcode 9; we need to have Xcode 9 for this tutorial. 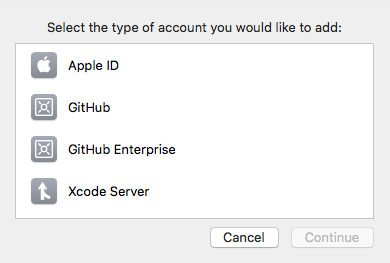 This step assumes you have already downloaded the Xcode 9 beta version from the downloads section of your Apple developer account and you already have Github account. In the Xcode preferences Accounts tab, click on the + button to get a list of services like Apple ID, Github, Xcode Server, and Enterprise Github. We now need to select Github and use our credentials to login into Github and follow the instructions on the screen to complete the setup. You can provide clone method SSH to HTTP. The Github setup in Xcode 9 is super simple. In the above GIF, we can see how easy it is to setup a GitHub account in Xcode and browse the GitHub from Xcode. Xcode has introduced another navigator called 'Source Control Navigator' near the project navigator. This shows all the information about branches, tags, and remotes about the current GitHub repo. It also shows the commits in the main pain. I have an example below which shows detailed information about the XCFit GitHub repository. As you can see in the image, it's very detailed. We can browse through it easily. Xcode now has the ability to pull, commit, and push from Xcode. In order to demonstrate that, let's modify a file and right click on the file to get source control options. We can then commit the file with a commit message straight from Xcode. The commit can be pushed using remote source using Source Control -> Push options. We might need to provide our credentials or SSH key and branch for the commit. If you are working on a new project, then you can create an entire Github project and push to remote using Xcode 9. You can see that Xcode-Github is created and commits start appearing in the feed. There are some useful features that Xcode introduced for Github but we will cover only those which are most important. Don't forget to watch the WWDC session 'GitHub and the New Source Control Workflows in Xcode 9' to learn more.